Been having a real sourdough phase at the moment, especially sourdough rye bread. If you want the recipe you can find it here. 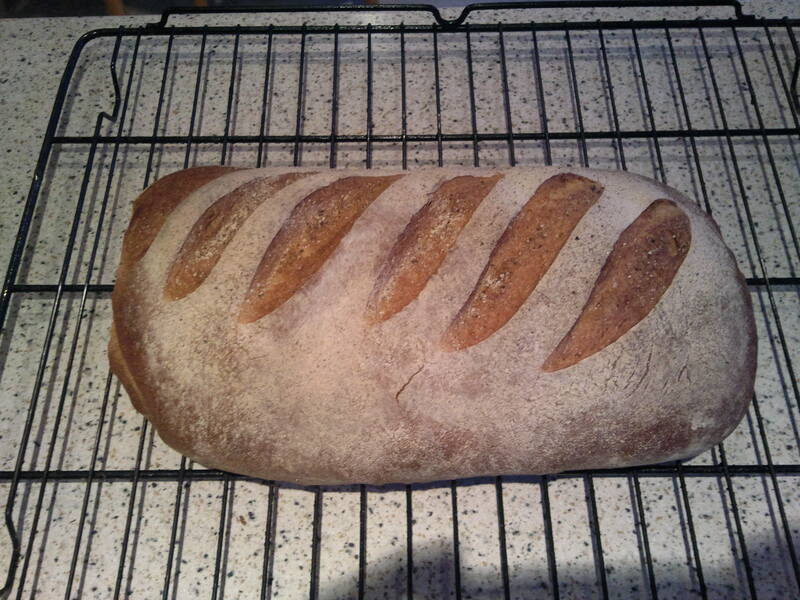 I made this loaf with half white bread flour and half rye flour to make it slightly lighter. I really like the combination of the slightly sour taste of sourdough with the nutty flavour from the rye flour. It makes a slightly denser loaf with a nice chewy crust and is great warm from the oven and covered in butter or dipped in some delicious home-made soup. As the rising times are long it is best to leave sourdough baking till the weekend. I also baked a cracking apple pie which went down really after our Sunday lunch (roast pork) with a dollop of lightly whipped cream. You’ll need to go for a brisk walk after this lunch!! I hope some of you took the opportunity to have a look at my book, and if you do please let me know what you think. After pimping my last cake with passion fruit I decided to make my first chocolate cake. All I did was substitute 50g of flour with 50g cocoa in my Victoria sponge recipe. This resulted in a light deliciously chocolatey cake that wasn’t too rich, even with a chocolate buttercream filling. I am really beginning to get the hang of this cake baking thing but I had better slow down or I will end up the size of a house! Well hello again folks. Did any of you try my Victoria sponge recipe? I have made it 3 times now but the last time I baked it I decided to “pimp” the recipe. I didn’t do anything too drastic. 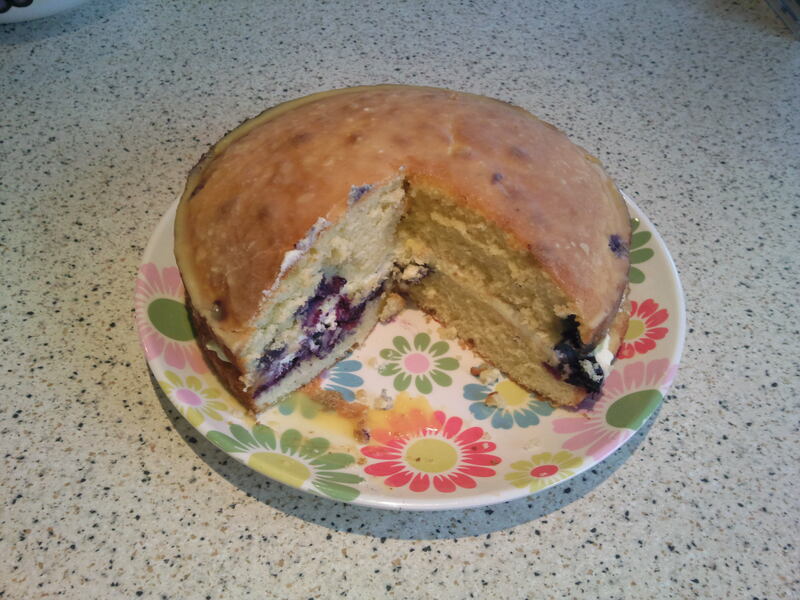 I added some blueberries to the sponge mix (always a winner – just look at blueberry muffins!). Next I made a passion fruit glaze by straining 3 passion fruit through a sieve to remove the seed. The juice was then mixed with 150g icing sugar (the amount you will need will depend on how juicy your fruit is and on what sort of glaze/icing you want. I made mine quite runny i.e. a glaze NOT an icing. After the cake has cooled, I gradually add several layers of glaze. With this cake I didn’t fill with jam, just fresh cream. The tang of the passion fruit perfectly complements the sweet sponge and rich cream. You really MUST try this variation as it is quite simply divine. Give it a go, take some photos and let us all know what you think or share your ideas for pimping the humble Victoria sponge. Well folks I have actually written my first book. This has been a real labour of love for me and was sparked off by friends and family nagging me! So I took some time out, took loads of pictures and compiled what I think is a pretty good book showing you all the fundamentals required to bake great bread at home. I have written it so that it will (hopefully) appeal to experienced bakers and novices alike. I have published the book on Amazon kindle and will be branching out and selling on other platforms in the future. – and if you like it please free to buy it :P.
I would ask you all to please have a look at least and if anyone does borrow/buy it I would love some constructive feedback. I am not a writer or salesperson, just a passionate baker who believes that good bread should be an important part of our lives and am trying in my own little way to do just that. Well I’ve been doing an awful lot of sweet baking and cooking recently but my first love is still bread. 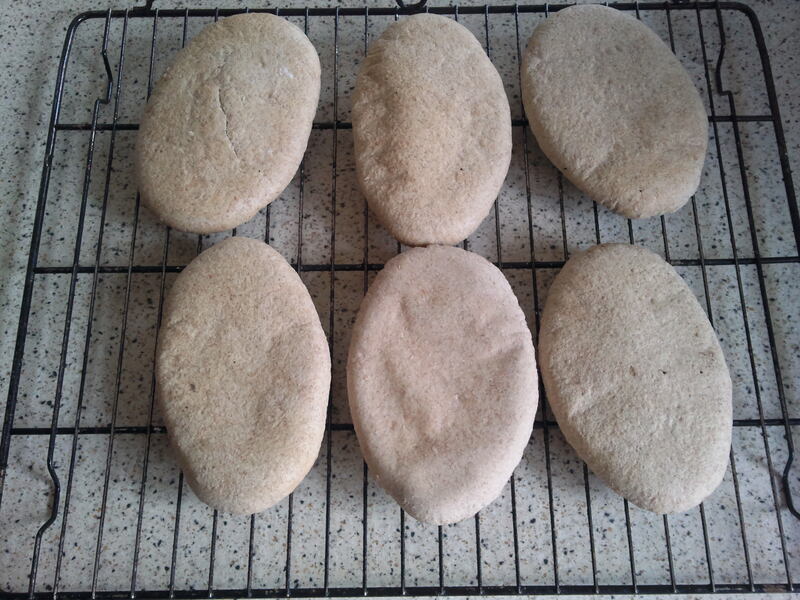 And I have just baked up a batch of pitta breads. They are easy to do and relatively quick as you don’t need to leave them for a second rise. Proceed as you would with a normal bread dough i.e. mix all the ingredients together and knead for 5-10 minutes to develop the gluten. Then leave to rise in a warm draught free place for about an hour. Put the oven on its highest setting 20 minutes before the end of the rise and place a baking stone or heavy baking tray in the oven to get hot. After the dough has doubled in size knock it back and divide into equal portions and shape into balls – I normally use 70g portions so I can get 12 pittas from this batch. Roll the balls out on both sides till you get the size of pitta you want. Once they are rolled out, placed them on the baking stone/tray and bake for 2-3 minutes on each side – they will normally puff up and balloon slightly. Then remove from the oven and leave to cool. I love to eat these with spicy chicken, grated cheese, salad leaves and greek yoghurt spiked with mint. Sprinkle on a little smoked paprika, cumin and fresh chilli and tuck in. Yummy!! These are so light and a million miles away from the dry rubbish you get in the supermarkets. Believe me, when you have tried these you will never go back. They are also great for freezing so bake a batch have one for lunch/dinner and freeze the rest. You will not be disappointed. Cream the butter and sugar till light and fluffy. Next add the eggs 1 at a time , mixing each one in. Then add the vanilla extract and finally mix in the flour. Add a little milk if the mix is too stiff. divide between 2 well-greased 20cm cake tins and bake in a preheated oven at 1600C for 20-25 mins. Place the cake on a cooling rack and leave to cool for 10 minutes before removing from the tins and leave to cool completely. Whip the cream to soft peaks and spread over 1 layer whilst spreading a generous amount of jam on the other. Place together and give it a light dusting of icing flour and tuck in. Well all I can say is, wow!!! This cake was so light and was absolutely gorgeous. My wife was gobsmacked. “How did you manage to get it so perfect first time?” she asked. “My cakes never turn out like that! 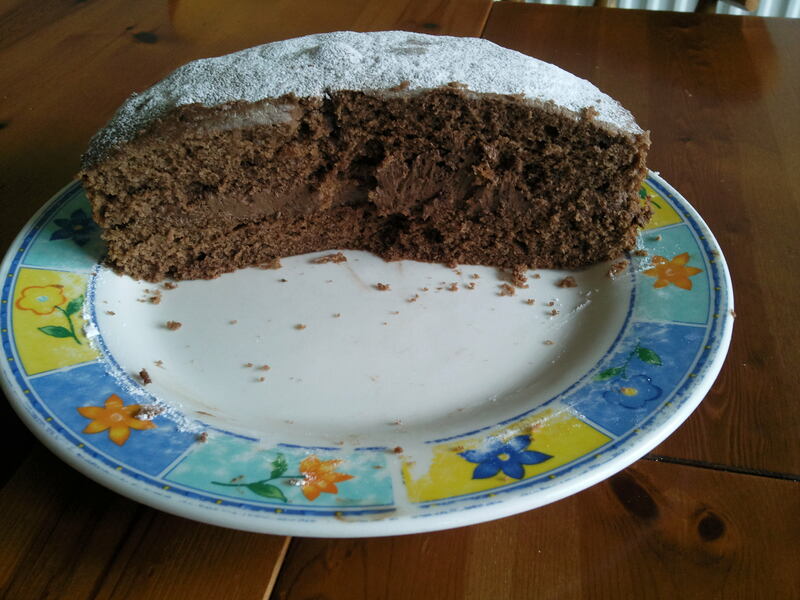 Perhaps it was beginners luck so next week I baked it again, replacing the fresh cream with buttercream – great results again so if I can do it you can too. I think the secret is in the eggs as my wife said that it seemed to be quite a lot of eggs – I have since spoke to a friend whose wife is an expert baker and she agreed. She said that to make great light cakes always add 1 more egg than the recipe asks for. Try this recipe and let me know how you get on. You will not be disappointed.